I felt prepared for the idea that, at some point, we’d be inundated with “why”? “Why do I have to brush my teeth?” “Why is the sky blue?” “Why do I have to go to bed?” That hasn’t really happened, although I think it may later. I was not, however, prepared for all of the other questions. “Who that?” she asked from her crib tonight, as the floorboards creaked under her daddy’s feet in the hallway. I ask you: how many people could there be creaking around in the hallway? Why does she need to ask? “Daddy,” I answered, and, reassured, she was quiet again. This has begun to happen while reading, too. We’ve been happily working our way through the Moomin books by Tove Jansson, and it’s like munching through a bowl of popcorn or Muddy Buddies or whatever your favorite snack food might be: it’s fun, and you don’t want to stop. 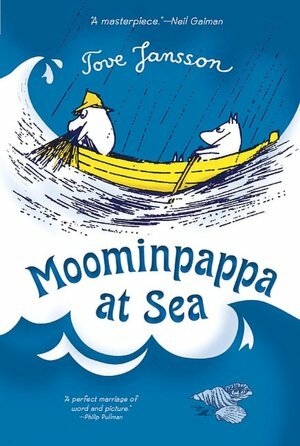 Although Finn Family Moomintroll, the second book, may be my favorite up until now, we are currently reading Moominpappa at Sea, the seventh of the Moomin books and one that we’re enjoying thus far. But reading isn’t just smooth anymore, not as simple as looking at Jansson’s charming illustrations and reading about the quirky characters who populate her world. Today, for example, we read these lines: “The boat lay on her side with her sail rolled up, looking as though she never wanted to sail again” (43). “Who lay on her side?” ML asked. “The boat. Sometimes boats are referred to as ‘she,'” I told her. We read about the missing key to the lighthouse. When I asked her what they were looking for, she said, “What?” After another “What?” or two, she answered. In looking for the key, Moominpappa approaches the edge of a cliff. “At the foot of the cliff he could hear the murmur of the breakers, the water rose and fell, heaved against the rocks, and then sank back like a clumsy great beast” (46-47). “What breaking?” ML asked. I explained that breakers were waves, in this case, and that nothing was breaking, exactly. And that’s just from a few pages. I know that her curiosity is growing. I know that this is how she’s learning what words mean and testing her questioning skills and increasing her comprehension. I know that one day, and probably one day not all that far off, she’ll stop asking so many questions (unless she takes after her Auntie Em! ), and I’ll think back on these days fondly. I also know that, this day, if I hear her ask “What?” one more time, I might start screaming “WHY?? ?” myself. Jansson, Tove. Moominpappa at Sea. Trans. Kingsley Hart. New York: Square Fish, 1966. Print. One of my students told me that her mother never let her watch Disney princess movies as a kid; as a teenager, she later binged on them at a friend’s house, but by that point, she understood her mother’s fears, and the romance of the princesses couldn’t really hold her in thrall. We haven’t kept all of the princesses at bay, but we haven’t encouraged them, either – although it is surprising the number of ways they pop up, from books to clothes to party favors and lots of things in between, like a stray cat you’ve fed who just won’t go away. We haven’t explored much of the Disney film catalog, either (although we did watch bits of Melody Time today), but we have read books based on Disney films, and we’ve read several books on which Disney films are based. You should try that for yourself sometime. It’s quite the experience. I hope the Lu-ster remembers the real versions, because let me tell you: of the three we’ve read so far (The Jungle Books, Bambi, and Mary Poppins), two films only brush up against the spirit of the original works, and one is so wildly different that at times, I wondered if we’d found some secret, subversive copy of the book. With two of the books, there were times when I wondered if I should be reading all of this to a one- or two-year-old. Sometimes – maybe all of the time – a magic wand would be welcome. I’d love to wave it over my daughter and magically make her a better sleeper, a toddler who doesn’t wake up every time she wets her diaper – or, better yet, a toddler who doesn’t wet her diaper and therefore doesn’t wake herself up! No straw, pencil, pen, stick, or skewer has done the trick, and Ollivander isn’t set up in a shop around the corner, so I’ve had to settle for persistence and patience – and it’s a good thing, because I’m going to need to cling to my patience for a long time: her nighttime waking isn’t changing. But her going-to-sleep pattern is. In early January, my husband attended a conference, leaving our daughter and me home for the better part of a week. What better time, I thought, to try to switch up our nighttime routine? For months, the last thing she had before bed was mama milk, which really meant that I had to put her to bed. I relished the intimate one-on-one time with her, but it also tied me to the house in the evening and, inextricably, to her bedtime routine. While my husband was gone, however, I switched the order: “milk, books, night-night,” I began saying, trying to impress upon her the nature of the change. As you might imagine, it wasn’t smooth; we all like our routines, and it’s hard to give up that comfort. It worked, though – even if the “night-night” part required enough back-patting, as she lay in her crib, to create an album full of percussion rhythms. He came back from his conference, and the new plan was in effect. Sunday night went passably well. Monday night, not quite a week into our efforts, it all went horribly wrong. “Milk, books, night-night,” I chanted. 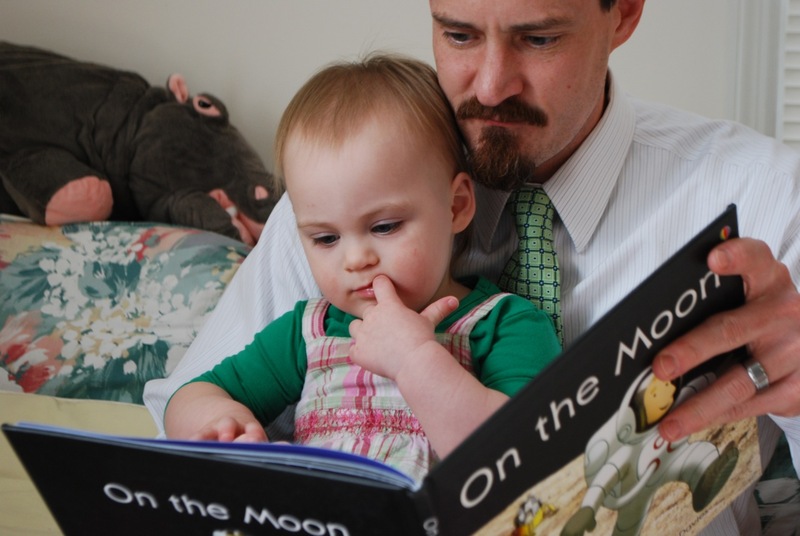 This time, her daddy read the books and tried to put her down – to no avail. We patted her. We rocked her. I nursed her. She cried. The crib? No good. The bed? No good. Each was, apparently, its own torture device; we must have had tacks and electric shock devices installed without my knowledge. At last, as a last resort, my husband drove her around. Being confined in her carseat is usually a useful, last-ditch tactic to get her to fall asleep. A nursing top-off upon return seals the deal, and she’s down for the count. After the drive, he brought her in, sleepy but not sleeping, and I nursed her. And nursed her. And nursed her. She was sleeping about as much as an Olympic runner is while waiting in the starting blocks. On the drive, she usually looks at the moon and dozes in its beatific presence. This time, she apparently commented on her surroundings: “Light….light….light….,” she said, as they drove past street light after street light. Finally, my husband says, he told her, “Close your eyes and go to sleep!” After a moment of toddler griping, she did. It didn’t last. Back in the house, our fail-safe method having failed, we were at a loss. We tried lying down with her together, the whole family turning in for the night. That didn’t do it, either. It was nearly 11. It was after 11. WE were tired. At 11:15, we left her in her crib. Oh, she cried! We lay on the couches, he with Harry Potter and the Goblet of Fire, I with The Big Year, and grimaced at each other over our books as her crying went on for five minutes….nearly ten minutes….longer than she may ever have cried at a time before in her whole life. Desperate times may call for desperate measures, but I was beginning to feel a whole new sort of desperation. By fifteen minutes, she was quiet. She was asleep. I felt guilty but relieved. The last last resort worked. We haven’t had to do that again. “Milk, books, night-night” is now a chant she’s taken up herself. If she asks for milk after reading, we remind her, and she’s mollified. If she stands up her crib as we pat her, calling for another book or, more likely, milk (“Mama moat!” it is, these days), “milk, books, night-night” reminds her to lie down. Now it is routine, and it’s one she can cling to herself. She is, again, comforted with the constancy – and I’m not the only one who can put her to bed. “Milk, books, night-night,” she chanted one morning to herself, well before her naptime. I followed her instructions, and she fell asleep at 9, at least two hours earlier than usual. Immersed as we are in Harry Potter (he’s reading, I’m rereading), I wonder if there isn’t a bit of magic in the incantation. I think there must be. I might not have a wand, but I did find the magic words. “Once [Horand] had heard the song of Fair Hilde, he could not get its sweet, simple tune out of his head. He began dreaming of it, wove melodies around the notes, he made the words more passionate, and when he sang the song in his own way by night, in his lonely fortress by the sea, the fishermen stopped pulling in their heavy nets to listen, and the fish they had caught escaped” (10-11). Alma Johanna Koenig’s Gudrun, translated beautifully from the German by Anthea Bell, also weaves a spell around the reader. As I read this aloud to my infant daughter, I found myself sneaking in a page here, ten pages there, throughout the course of the day and feeling quite good about it, as it exposed her to many new words. A prose adaptation of the story thought to be the precursor to the Nibelungenlied (think: Wagner), the story is at turns romantic and violent, with beautiful language to enchant the reader, even in translation. Hilde and Gudrun, mother and daughter, share a great beauty and consequently, each is greatly desired and greatly fought over. Both show a single-minded devotion in love, and many people die as a result – although the deaths are, perhaps, more caused by the men who hopelessly or blindly pursue the women, bringing with them armies to prove their strength. Power and love seem to be inextricably intertwined. “Many good warriors died there; blood stained the rough sea water, floating on it like oil, and sea swallows darted to and fro above the clashing swords, screeching and circling over the cliffs where they nested in alarm” (66). Hilde’s story lays the groundwork for her daughter’s tale. A great beauty in her own right, Gudrun is wooed my several men, including the Prince of the Moors, Hartmut of Normandy, and Herwig of Zealand. At last she falls in love with Herwig but does not marry him immediately, which causes more bloodshed. A cast of supporting characters – Frute, the rational and far-seeing lord; Wate, the descendent of giants with a giant fury in battle; Horand, the singer whose voice enchants, saddens, and empowers; and Gerlind, the almost-heartless mother of Hartmut – moves the story forward, one judgment, one slash of the sword, one song, one machination at a time. As with many stories written down later than they were created, including Beowulf, Gudrun suffers a bit from the clash of Christian tradition with a more strongly-felt pre-Christian set of moral codes. In most cases, however, the awkward intrusion in the story passes quickly, and on the whole, the pre-Christian values have their day: men fight for their honor, and forgiveness, while it plays a role, shows itself more in fairness in battle than in the ceasing of battle. This story of love, loss, and family ties is made more poignant by Anthea Bell’s note about the author: “In 1942 Alma Johanna Koenig, as a Jewess, was deported from Vienna to the concentration camp of Minsk. Unlike Gudrun, she was to have no happy ending; nothing more was ever heard of her” (187). Perhaps the novel itself, with its bloody battles and thousand killed, is more relevant than it might seem. Horand gives Gudrun the rather questionable gift of “grief–the grief the gods give to those they love…”(43). The grief permeates the novel – inside and out. Koenig, Alma Johanna. Gudrun. Trans. Anthea Bell. New York: Lothrop, Lee and Kestrel, 1979. Print. Reading to children is a good thing, and I don’t think that’s a particularly controversial statement. It’s not like saying that TV is good for children – I don’t think there really are two sides to this one. We decided to start early: we read to our baby while she still made her home inside of me. Every night, my husband would get out one of our books (Tacky the Penguin; Let’s Dance, Little Pookie; etc.) and read, his mouth near my belly, sending a very early statement to our daughter about reading – and how much we love her. He ended every session with his advice for her (although we didn’t know ahead of time if she was a boy or girl, so we just called her “Baby”) to grow and become “big and strong” – but as her birth approached, he thankfully changed it to “not too big and strong.” She listened. Now that she’s joined us, we’ve been reading to her every day without any barriers; she can see the pages and the pictures, and she smiles particularly when she sees Pookie books. Does she remember the voice that came through to her in the womb while she was busy growing into the small, wonderful person that she is? But we don’t just read her books with pictures that she can enjoy. I’ll read her excerpts of articles from magazines and books that I’m reading, and I also read her books in full of a more grown-up sort. It started when she was just new, her first week in the big world, and I took out my childhood copy of The Secret Garden. Over the course of several weeks, I read to her while she nursed – which means I read to her a lot. I didn’t want to read just to myself since it would take me away from the special, intimate moments with her, so I read to her – and I’ve been doing it ever since. Now I’ll read to her while she nurses or while she’s playing, and I like to think it’s good for both of us. I get to read more than just The Very Hungry Caterpillar (although it is one of my favorites), which makes it more exciting for me, and she certainly hears a wider range of vocabulary (and ideas) than she would if we were only reading books for very small children. It’s also a good way to work through some of the many books on our bookshelves! So far, we’ve read The Secret Garden, The Good Thief, The Five Little Peppers, Rascal, Reflections on a Gift of Watermelon Pickle, and now we’re into Gudrun (by Alma Johanna Koenig). Along the way, I’ve been discovering some old favorites and enjoying some great lines. As my little one grows in her understanding of the world (when she drops a spoon while sitting in her high chair, she looks down to the ground to catch sight of it), the books are right there with her, giving her a hint of just how much the world can hold.